Sometimes a television programme concept comes along that, on the face of it, seems like it could never work, yet somehow captures the imaginations of millions of people and propels it into one of the most popular series. There are a few examples of this but would you really expect a comedy about three pensioners and their exploits in the Yorkshire countryside to have been one of them? I guess not, but the BBC’s ‘Last of the Summer wine’ proved to be a huge hit. Thirty one series of the show were commissioned making it the longest running comedy show in the world! Of course the stars of the show were the three elderly main characters but some would argue that the other main star was the idyllic Yorkshire countryside that graced each episode. This of course was primarily the town of Holmfirth, a beautiful town with a small population of around two thousand. Visitors still flock to Holmfirth to not only remember the show but also to take in the beautiful surroundings. Now, I do not recall ever seeing such an occasion in one of the episodes of ‘Last of the summer wine’ but it seems that in Holmfirth and indeed across many towns and villages across the UK, there is fast growing fascination for a certain Medieval feast, particularly for enjoying at special occasions and events. It is one that I am show Compo, Cleggy and co would have enjoyed and that is the hog roast Holmfirth event. If you had to think of a more appropriate meal to enjoy in such lovely surroundings then you would struggle to think of anything quite as good as a roasted hog. Everything about a hog roast seems to suggest the great outdoors, the smell of the country air and general feeling of freedom, and that is certainly the feeling you get from being in and around the town of Holmfirth, which could go some way to explaining why the folk here love their hog roast so much. This is an area where great quality food is in plentiful supply, not least from the regular farmers market that takes place in the town. Perhaps it is the case that people here know what a good needs to make it so special and that’s why they love Taste the Cracklin’s catered events. It’s an informed decision because a Taste the Cracklin hog roast uses only the very best quality meat indeed. It may seem odd to talk about such great quality ingredients when discussing event catering but this is what is helping make hog roast stand out from the crowd when it comes to choosing the catering for an event. For the last couple of decades the United Kingdom has had to put up a really poor choice of food for special occasions such as plain salads, pies, hot pots and other less than inspiring options. It could be that those days are coming to an end as hog roast fever really does take hold and we see more and more people plump for a bit of spitting pig! Hog roast offers something for everyone, in fact it is the total catering solution. 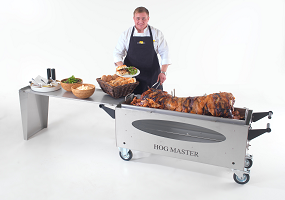 If you have guests who are fussy about their meat then hog roast should certainly pacify them. Our caterers know what makes a good hog roast and they go out of their way to find the perfect pig for every roast that they do. It has to be just the right size, have just the right amount of fat and be a local, well reared pig. It’s going to be a great option for those guests who love a bit of traditional cooking, too, because hog roast is a slow roast fan’s dream meal. Did you know that a standard sized Holmfirth hog roast takes around six hours to cook, giving it the perfect juicy taste and the ultimate in crispy crackling? It’s no wonder that it tastes so good. And what about those events where you really want to invite absolutely everyone but you think it will send your catering per head budget through the roof? Not with hog roast. Here is a meal that will feed over one hundred people with ease. Events in Holmfirth deserve great food so do them proud. Make sure that your next event in this lovely part of Yorkshire is good old Holmfirth and a Taste the Cracklin hog roast.